Cabana claims Punk told him in a text his legal bills would be "100% covered." They were not. Fighting a defamation lawsuit can be expensive, even if you prevail, and wrestler-turned-color commentator and podcaster Colt Cabana (whose real name is Scott Colton) is the latest proof of that. Way, way back in November and December 2014, Cabana used his The Art Of Wrestling podcast to do a couple of interviews with CM Punk (whose real name is Phillip Jack Brooks, and who was a long-time friend of Cabana’s dating back to their early days at the Steel Domain Wrestling Academy in Chicago) about Punk’s messy exit from WWE (transcript of the first one here), with Punk (seen above after a UFC 225 loss in June) lodging particular complaints about the medical treatment he received during his time with the organization, claiming they had him wrestle in the immediate aftermath of a concussion, misdiagnosed a staph infection and more. It’s certainly unfortunate to see that. And it will be interesting to see what comes of this. 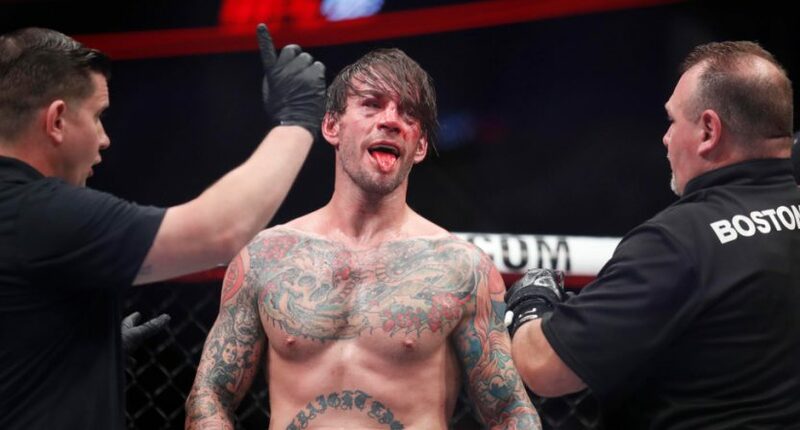 It’s the latest negative story about Punk, who made a big move to the UFC from WWE in December 2014, didn’t fight there until August 2016 (but got a Fox Sports 1 documentary chronicling his journey), and lost that first fight badly (but gave a nice speech). He then didn’t compete for a while before losing his second UFC fight badly this June, with opponent Mike “The Truth” Jackson afterwards saying “Stop…you’re putting your health at risk.” At 39 and with an 0-2 UFC mark (and two bad defeats on his record), his future with the organization seems pretty iffy. And now he’s facing a lawsuit from an old friend as well. We’ll see how that works out.